This one is for all French dessert lovers. 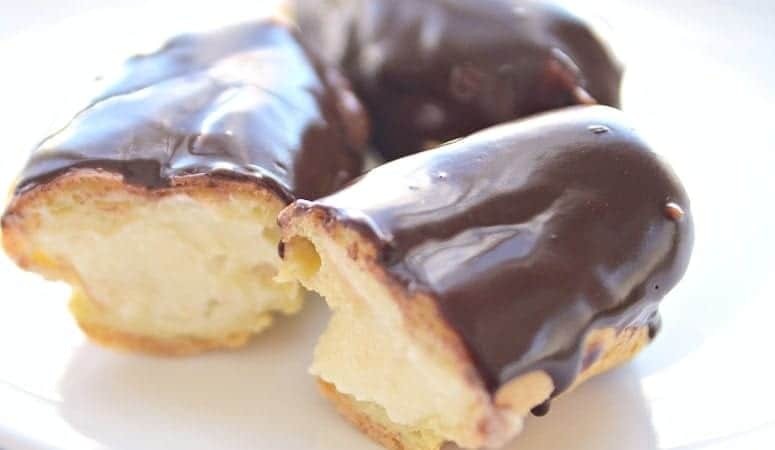 This Chocolate Eclair Recipe is one of the most famous and most delicious desserts ever created. And I’m going to help you make this classic French treat at home. Today’s recipe is a blast from the past. Well, at least from my past. Although today, you’ll find eclairs in almost any bakery, when I was a little kid, this decadent dessert was a rare treat. My chocolate eclair recipe is anything but ordinary. Think of all the adjectives to describe a dessert of your dreams and you’ll find all of these words in these simple yet scrumptious eclairs. You already got the idea, right? :) I’m a huge fan of eclairs. Given that they are covered with rich dark chocolate glaze, eclairs officially take a top spot in my favourite desserts rating. Remember how good was my French Dacquoise Cake With Mascarpone Cream? Well, these Eclairs are on the same level of deliciousness. After all, I wouldn’t expect anything else from French desserts. If you want to get straight to the recipe, just scroll to the bottom of the page where you can find a printable recipe card and a video tutorial. 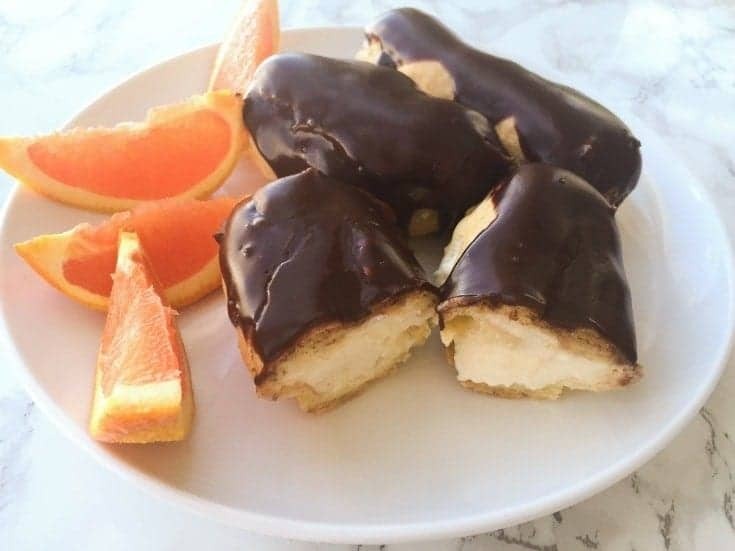 These homemade chocolate eclairs are light and so addictive. It’s hard to resist the temptation to eat the whole batch. In fact, once the last eclair is devoured you’ll be craving some more. Eclairs are a traditional French dessert made with choux dough and filled with a cream. Eclairs have oblong shape. They are hollow on the inside and crispy on the outside. Eclairs originated in 19th century and it’s believed that they were first created by the famous French chef Marie-Antoine Carême. 1. Start off with preheating the oven to 400 F and lining two sheet pans with a parchment paper. 2. In a medium non-stick pot combine water with salt and bring it to a boil. Add butter and bring everything to a boil one more time. 3. Add flour and whisk vigorously until no lumps remain and the batter thickens, about 1 minute. Remove pot from the heat and let the batter cool for 5 minute. 4. Whisk in the first egg and mix with a wooden spoon until the egg is fully incorporated into the batter with no white lumps. Continue whisking in the remaining eggs, one at a time (See the video in the recipe card below). 5. Using a pastry bag fitted with a large plain tip (I use Wilton #1A), pipe fat lengths of dough (about ¾ – 1 inch thick and 4 inches long) on the lined baking sheet, leaving 1 inch of space between them. Without opening the oven door, reduce the temperature to 340 F and bake for another 15-20 minutes until eclairs are light golden brown. Remove from the oven and cool on the wire rack. 1. In a small bowl dissolve a cornstarch in 3-4 tablespoons of milk. 2. To a small sauce pan add the remaining milk and bring to a simmer. Add 50 grams (1/4 cup) of sugar and stir until sugar dissolves. 3. When milk starts to boil, add a dissolved cornstarch and whisk until no lumps remain. Remove from the heat and cool until just slightly warm or completely cold. 4. In a large bowl beat the butter with the remaining 50 grams (1/4 cup) of sugar and vanilla extract until the mixture turns almost white. Combine the whipped butter with the milk and cornstarch mixture. Mix well and set aside. In a large bowl beat the heavy whipping cream until soft peaks form. Fold whipped cream into the butter and milk cream. Using the tip of a small knife, cut 3 small Xs along the top of each pastry. Using a small tip (I used Wilton tip #32), pipe the pastry cream into the shells through each opening. You can totally freeze the Eclairs. The best recommended method would be to freeze Eclairs before you fill them with a pastry cream. After you bake the shells, place them in the airtight container and freeze for up to 6 weeks. To defrost, place Eclair shells in the warm oven for a few minutes until they are crispy again or defrost on the counter for 20 minutes. After that you can fill them with a fresh pastry cream. Since pastry cream is made with cornstarch, it’s not recommended to freeze it. Eclairs will also keep in the fridge for up to 5 days. At first, the process of making Homemade Eclairs might seem complicated. But believe me, it is easy. Once you get the hang of it, you’ll be making these chocolate eclairs like a pastry chef. If you like this recipe please share it on Pinterest. I would greatly appreciate this! I hope you found this post useful. Let me know in the comment section if you tried this recipe and what is your favorite filling? 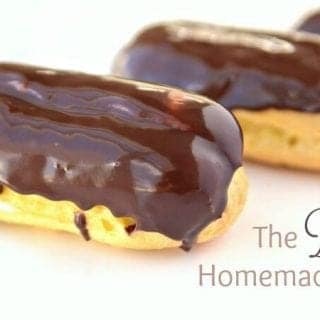 If you make this Chocolate Eclair recipe, snap a picture and post it on Instagram with a hashtag #lavenderandmacarons. I’d love to see your creations. Recipe Video Above. 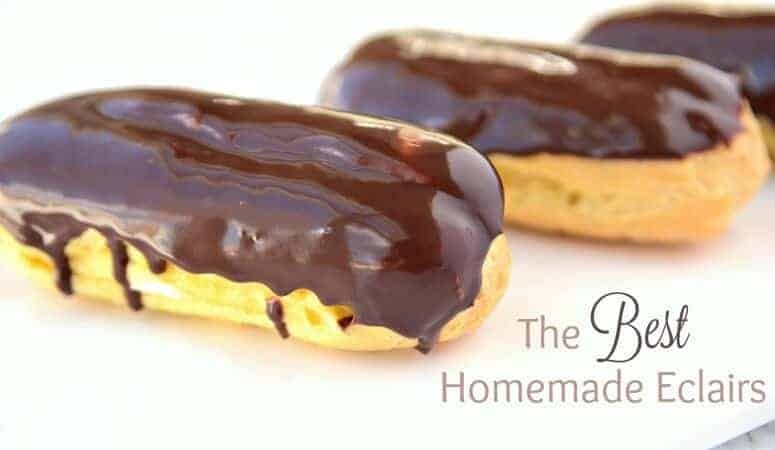 These Homemade Eclairs are a scrumptious treat you can easily make following my step-by-step instructions. Classic French dessert recipe you'll be making again and again. Preheat the oven to 400 F and line two sheet pans with a parchment paper. In a medium non-stick pot combine water with salt and bring to a boil. Add butter and bring to a boil one more time. Add flour and whisk vigorously until no lumps remain and the batter thickens, about 1 minute. Remove pot from the heat and let the batter cool for 5 minute. Whisk in the first egg and mix with a wooden spoon until the egg is fully incorporated into the batter with no white lumps. Continue whisking in the remaining eggs, one at a time (See the video). Using a pastry bag fitted with a large plain tip (I use Wilton #1A), pipe fat lengths of dough (about ¾ - 1 inch thick and 4 inches long) onto the lined baking sheet, leaving 1 inch of space between them. In a small bowl dissolve a cornstarch in 3-4 tablespoons of milk. To a small sauce pan add the remaining milk and bring to a simmer. Add 50 grams (1/4 cup) of sugar and stir until sugar dissolves. When milk starts to boil, add a dissolved cornstarch and whisk until no lumps remain. Remove from the heat and cool until just slightly warm or completely cold. In a large bowl beat the butter with the remaining 50 grams (1/4 cup) of sugar and vanilla extract until the mixture turns almost white. In a large bowl and using the electric mixer, beat the heavy whipping cream until soft peaks form. Fold whipped cream into the butter and milk cream. Melt the chocolate chips and heavy whipping cream in a medium saucepan set over a pot with about 1 inch of boiling water. Whisk until the mixture is nice and smooth. Alternatively, you can heat chocolate and cream in a microwave for about 30 seconds and whisk until smooth. Remove from the heat and cool for a few minutes. Dip the top of each eclair into the chocolate glaze and set aside to allow the glaze to harden. * Don't open the oven during baking. Otherwise your Choux pastry won't rise and you'll have to start all over again. **It's best if milk-cornstarch mixture and whipped butter are of the same temperature. If the milk is too hot, the cream may become too runny. It's not a problem though. If this happens, place the cream in a fridge for an hour or until it thickens. Don't forget to try my Eclair Cake Recipe. Same great taste in a form of a cake. First time trying eclairs and these turned out great! I couldn’t find the large tip for piping the dough but the large coupler on its own worked great. Thanks for such a detailed recipe! You’re welcome Julie! I’m very glad you liked the recipe! Oh, I’m sorry the first batch didn’t puff up properly. But I’m happy you still had a success with your second batch! I had the problem with flat eclairs only 2 times. One time I forgot to add the eggs (seriously:))) and the second time my oven door had a teeny-tiny opening which resulted in completely flat eclairs. I never really paid attention to preheating the oven 30 minutes in advance or letting the piped eclairs rest before baking. However, the only time I let the dough rest is right before I add the eggs thus allowing the dough to cool off. In either case, I’m glad you you liked my recipe and I’m wishing you a Merry Christmas! Making for the first time. I only have a Wilton 5; can I use that or should I pipe without a tip? Wilton 5 is a little narrow, I would pipe without the tip. I used the coupler w/o the tip. They look so so I guess…may try again. Mary, when I was making eclairs for this post, I didn’t use the tip either. You can see on one of the collage photos within the post. They came out just fine. 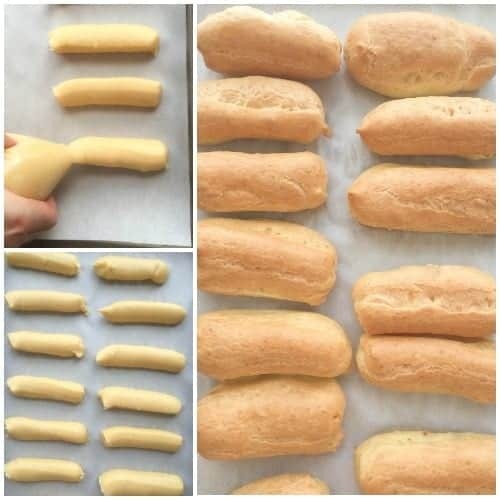 For the filling, I recommend you cut each eclair in half lengthwise (just like I did here https://www.lavenderandmacarons.com/desserts/mini-chocolate-eclairs-easy-recipe/). And you can either spoon the pastry cream on each eclair or pipe it using a pastry bag without a tip. How many eggs please? I think the number of eggs are not mentioned in the recipe. My apologies! Last week I updated the post and probably forgot to add eggs in the recipe card. Fixed it. It’s 4 eggs total. What size of eggs do you use? I usually use extra large eggs. My daughter LOVES eclairs and I usually buy her some but now, thanks to your detailed yet easy recipe I can whip some up for her! Bookmarking this to try soon! This is a fancy recipe and you have accomplished it very well. Thanks for the recipe. Thanks Natalie! There are my favorite treats too! These are simply delicious! 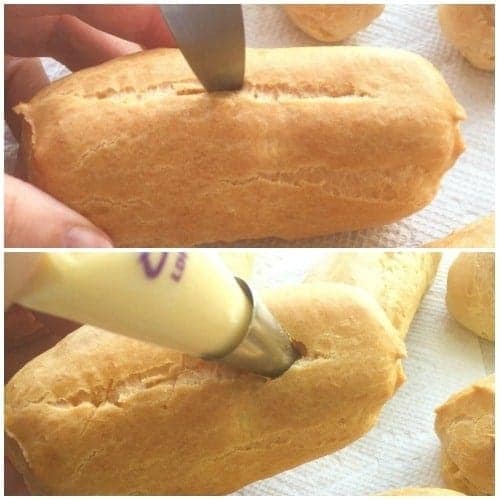 I never would have thought that making eclairs was so easy! I’m drooling!! Saving this recipe – They look absolutely delicious! I love eclairs!!! Such a a beautiful classy dessert!!! I tried this recipe and I feel that the way it is written caused me confusion in some parts (especially when it came to making the cream). Granted, I managed to finish, but I was only able to salvage 2 – 3 eclairs. It would help if a section started out with, “in a large mixing bowl” or “in a medium sauce pan” because it would make me feel more prepared. J M, thank you so much for your comment! Sorry for the confusion with the instructions! I love this recipe! I have made it in the past with no.problem. Today, however, I msde it and my milk & cornstarch mixture came out lumpy. Any suggestions on howvto make it smoother? I’m so happy you like this recipe Shannon! If your finished pastry cream came out lumpy, you can fix this by straining the cream though a mesh sieve. Let me know if this helped. When making the dough, the minute I added the flour to the hot water butter and salt it almost instantly formed into a dough ball. Should I of let it cool slightly before adding the flour? Hi Cynthia! Yes, it supposed to be like this. Don’t wait until water cools down before adding flour. You can store them in a ziploc bag to prevent from drying out. You can also freeze them in a plastic freezer bag. Just make sure to remove the excess air from the bag. Hope that helps! I should have specified. They are completely made, filling and all. Will this hurt them going in the fridge? I’m bringing them to work in the morning. Yes, the above method is for the cooked eclairs. They’ll be fine in the fridge. Hope you’ll like them! We tried the recipe and followed everything but the dough wasn’t the best. The glaze and cream were good and when we put them together, the dough tasted like egg. Sorry Lynn that your dough didn’t come out good! This is so strange. It never happened to me before. Did you make sure there was no egg lumps in the batter and the batter was smooth before piping? According to Google, if eggs are not fully incorporated and there are white lumps of cooked egg in the batter, it might result in eggy taste of eclairs. I’m not sure if that’s what happened to your dough though. Same here and mine didn’t rise. I think the dough has to cool slightly before adding the eggs so they puff in the oven. The cream was to die for. May try again using the cream with a different dough recipe. I’m so glad you liked them Nisreen! You’re welcome! Did you use dark chocolate chips? No, it shouldn’t be completely cool, just not very hot. When I combine butter-sugar with the milk-cornstarch mixture and heavy cream, I do it with a spatula. I use mixer only for beating the butter and heavy cream. You can refrigerate the cream if you want for up to 2 days. Is this self rising flour or pain? It’s a regular all-purpose flour. What kind of milk do you use? Is 1% ok? I use whole milk but 1% is fine too. Made them today for Iftar. Loved it. Especially that you dont use any sugar in the choux. Certainly will keep the recipe. My Family and I tried this recipe a couple days ago and they were scarfed down in two days flat. They turned out wonderful and just like the pictures. The only problem was the proportions, the recipe made way more cream and chocolate dipping sauce than necessary for the amount of puffs that it made. So either double the puff amount or cut down the cream and chocolate amount. Thank you so much for this recipe, I will definitely make it again. I’m so glad you liked them Sara! I’ve made them recently as well and while I can’t really recall for sure if there was too much cream left, I remember we had some leftovers of chocolate sauce as well. I probably need to modify the proportions a little bit. Can you bake the dough ahead of time and keep them to fill a few days later? Have you tried freezing them, then thawing them out to fill? I’m making these right now and so far they are turning out great, I am wondering if you refrigerate yours for next day use? Thank you! I made mini bite sized ones for our Easter brunch at church tomorrow. They are really delicious, now to keep the kids away from them until brunch tomorrow! Thank you for the recipe! That’s a great to make mini eclairs! I’m glad you like them. At first I was skeptical, the dough was turning out weird but in the end it turned wonderful. My cream was a bit liquid though. I’m not sure why this happened. I tested this recipe many times and the cream always came out just fine. When you dissolved cornstarch in 4 tablespoons of milk, did you remove those 4 tablespoons from the amount of milk you brought to simmer in the next step (not 350 ml but 350 ml minus 4 tablespoon)? I wonder why the recipe is only in grams. I will have to figure out the difference, as I only know cups and measuring spoons. Hazel, sorry about that. Some recipes in particular French desserts require precision, therefore I list the ingredients in grams. That being said, I realise not all of my readers have a digital scale, so I updated the recipe with imperial units. Hope that helps! Hi, I live in New Zealand and I made these today, can I just say that these are delicious. I followed that recipe to a T and it was delicious. I’m not sure tho If my filling came out right, it was quite runny but still really yum. I can’t stop eating these. Yum yum yum. I love eclairs! I always thought they were really hard to make and take a lot of time, but this recipe is totally something I could do! I can’t wait to give it a try! When you reduce the temperature during baking, do you bake for 20-30 min at the lower temperature after the oven has gone down in temp or start right when you lower the temp? Also, what kind of chocolate chips (milk , dark, semi-sweet, etc.) did you use for your chocolate glaze? When you reduce the temperature to 340F, you don’t open the oven and don’t remove the eclairs. You leave them there and bake for another 15-20 minutes at a reduced temp. So you’re starting right when you lower the temperature. It’s important that oven door is closed at all times during baking. I believe, I used semi-sweet chocolate chips, but it’s a matter of taste. You can use any kind you like. It’s exciting, let me know how they turned out. I’m sorry to say this but,they turned out awful for me they raised in the oven and a minute after I took them out they went flat.?? Did you follow the temperature regime suggested in a recipe (bake at 400F and then reduce to 340F)? Did you by any chance open the oven door while baking? These are my guesses of what could possibly have gone wrong. I definitely like to eat chocolate eclairs, but I’ve never tried making them! I always assumed it was too complicated! I have been wanting to make eclairs for awhile, since I know they’re not quite as complicated as they look. Yours look beautiful! Thanks for the recipe. Eclairs are my husband’s favorite! I’ll have to try these! So impressive! Eclair’s are like classy donuts! Thanks for sharing! XO.